The Media and Makers: Khartoum 2013 forum was attended by about 100 leading Sudanese journalists, bloggers, reports, editors and publishers. 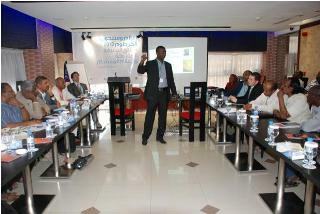 Sudanese publishers maintained that print media in Sudan is challenging the trend of worldwide decline. Saying that as a developing country with limited access to new technologies, print media is still has a long-term future. Recent statistics show that close to a fifth of Sudan’s population has access to the internet, ranking it 11th in Africa’s top internet users. The figures showed that Facebook, Google and YouTube are among the most visited websites in Sudan, with online forums, E-newspapers and online versions of some of the county’s best-selling print dailies also in the top 20 of most visited sites. Those in attendance at the Khartoum forum heard from experts(in their respective fields) on how innovative business models can generate alternative revenues for publishing companies, ways journalists can increase their income, how new technology can enhance the quality of Sudanese journalism and methods to improve access to information.